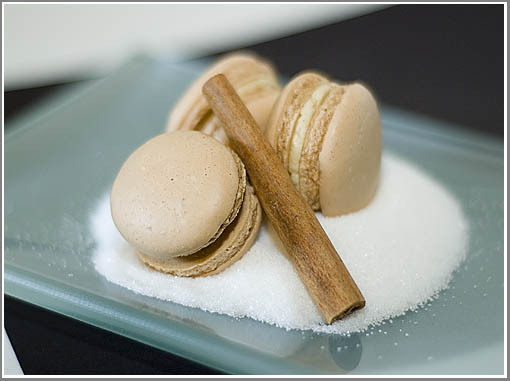 Macarons and foodbloggers go hand-in-hand. There’s something about these little cookie sandwiches that captures our imaginations and urges us to create new and exciting flavors. I think everyone that makes macarons gets caught up in the excitement and is ultimately consumed by these treats. I, for one, have been consumed by trying to make the best macaron I can. Macarons are a tricky thing to master. They only require a few simple ingredients: sugar, almonds, and eggs, yet time after time the one ingredient that always seems to get added is failure. The techniques aren’t complicated yet once they are all put together, you are only afforded the smallest of miscalculations. Grind almonds with sugar, make a soft-peak meringue, fold, pipe, and bake. Sounds simple, doesn’t it? About a year ago I thought I finally found a foolproof recipe. I tested and retested and everything seemed to work out just fine. I was even ok with a slightly sweeter product as long as it produced consistent results, but again I was wrong. I tried out my foolproof recipe a few weeks back and found out that it, too, was flawed. My macarons looked to have come out beautifully but upon further review, the shells were crisp, hard, and brittle: it was back to the drawing board. Checking my RSS, I saw that Veronica had a similar sucre-cuit recipe. 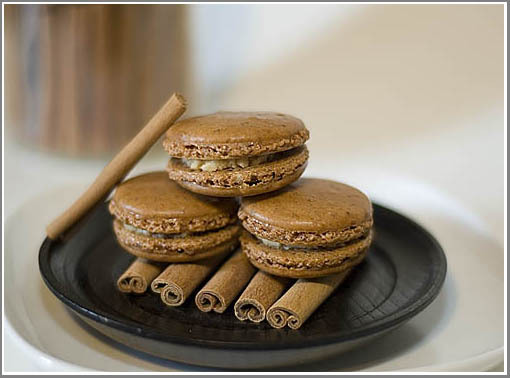 This recipe was from a macaron master, Pierre Herme, how could it go wrong?! So I gathered my ingredients, assembled my equipment, and followed the recipe exactly. There were no surprises in this macaron recipe: cooked sugar syrup is added to whipped egg whites to create an Italian meringue, almonds and sugar is ground and sifted, everything is folded together, and finally piped to size. I was excited to see them dry out and even more excited to see them cook up so nicely. Only one or two cracked and the rest came out looking great. That’s where the success ended. Once again, my perfect looking macarons came out hard and brittle. These more closely resembled meringue cookies than macarons. I soldiered on, filled the cookies, and hoped a short stay in the refrigerator would soften them but I was wrong, again. As much as it broke my heart, yet another batch of macaron made a trip to the trash, they were still beautiful though. After this round of failure, I needed to prop my ego up a little bit so I picked a tried-and-true recipe from Helen the macaron veteran. Her recipe, lately, has worked great for me; this time was no exception. I was able to put together the entire recipe quickly, have everything piped out and dried, cooked, filled, and assembled in no time. Again, there was minimal cracking and the feet came out excellently. I think I have a go-to recipe now. I will still play with my own recipes, foolishly, but this recipe is a winner and I will keep coming back to it. I was really sad to hear that the PH batch turned out hard and cookie-like for you 🙁 I’ve used, successfully, a recipe fairly similar to your one and the PH one for a number of years. 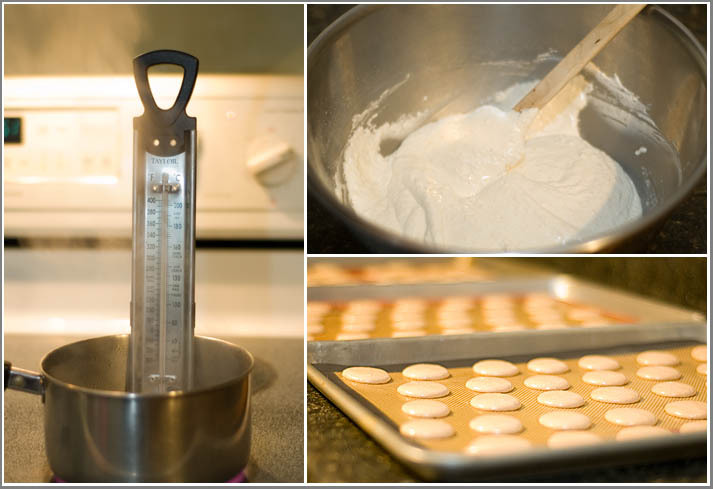 It’s such a pain that we macaron makers have to go through the trial-and-error for each specific oven! I still feel, however, that the sucre-cuit method yields a superior result. They look great, and I love the photos! I’ve been using your macaron recipe since i first came across it and it has never failed me- thank you! My macarons come out crisp and chewy though. If Helen’s recipe gets your vote, i definitely have to try it asap. Thanks for sharing it! Helen has loads of varieties and they’ll all good. Her basic recipe is pretty much the same for all of hers. Those look amazing! Do you by any chance have a direct link to Helen’s macaron recipe that you used?? These are awesome, Jef. I’ve been eating them all weekend!